The Feedbag goes to the Grilled Cheese Contest at Artisanal from The-Feedbag on Vimeo. 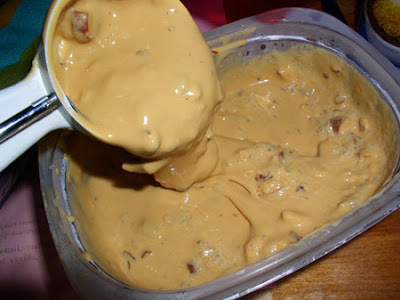 I liked the idea of adding a little kick to the cheese with paprika and mustard. It reminded me of when I would sleepover my best friend’s house in elementary school. Her mom would make the best grilled cheeses with Velveeta and spicy brown mustard. So I decided to use the Toasted Cheese recipe to spice up my grilled cheese routine. Inspired by a recipe from The International Jewish Cook Book By Florence Kreisler Greenbaum, 1919. Grilled cheeses are really something I can get behind. “…We have knowledge of several old-fashioned gardens where the mint bed under the southern wall still blooms luxuriantly ; where white fingers of household angels come every day about this time of the year and pluck a few sprays of the aromatic herb to build a julep for poor old shaky grandpa, who sits in the shady corner of the veranda with his feet on the rail and his head busy with the olden days. In such a household the art is still preserved. With her sleeves rolled up, the rosy granddaughter stirs sugar in a couple of table-spoonfuls of sparkling water, packs crushed ice to the top of the heavy cutglass goblet, pours in the mellow whiskey until an overthrow threatens and then daintily thrusts the mint sprays into the crevices. And the old man, rousing from his dreams, blesses the vision which seems to rise up from the buried days of his youth…. 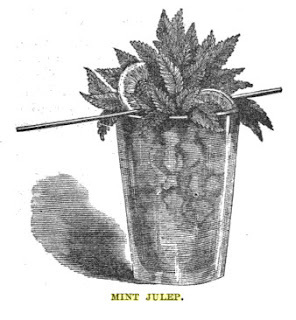 I like the idea that the mint julep was “out of fashion” in the 1860s. Perhaps because of the Civil War? Burnt Almondy Ice Cream Goo. We’re continuing our ice cream social agenda with Burnt Almond Ice Cream, another flavor pulled form Lincoln’s Inaugural Menu. This is a custard ice cream, so it’s a little more difficult than what we’ve been making up until this point. And I’ll let you in on the surprise ending: mine didn’t turn out. It didn’t freeze in the ice cream maker, and it’s currently a Tupperware of goop sitting in my freezer. I did something wrong in this recipe, I just don’t know what. The great tragedy is that it TASTES AMAZING. I think I’ll try serving it as a sauce on top of other ice cream. At any rate, give this recipe a try, and if your results are more successful than mine, please let me know. Boston, Little, Brown And Company (1896). 1. Mix half the sugar, flour and salt. 2. Add egg, slightly beaten. 3. Add milk slowly, whisking constantly. 4. Cook over a double boiler (or makeshift double boiler) for 20 minutes, stirring constantly the first 15 minutes. If you’ve made a custard before, this may not look as think as you think it ought. But don’t worry, it will thicken up when you add the caramelized sugar. Left: Makeshift double boiler. Right: Caramelizing the sugar. Do not try to taste the caramelized sugar by sticking your finger in it; its is very very hot and you will get burned very very bad. Like me. 5. In the last five minutes of cooking time, caramelize the sugar. Put the remaining sugar in a non-stick saute pan over a low heat. Stir constantly. When the sugar begins to melt, it will caramelize soon after. You want the sugar to be completely melted and the color of maple syrup. Take care not to burn it. 6. With the double boiler still on, drizzle a fine stream of the caramelized sugar into the custard, whisking constantly. As the sugar hit the custard, and might cool slightly and become gooey. Don’t fret, just keep stirring until the sugar is fully integrated. 7. At this point, you custard will be a dark brown. Add the cream and vanilla and combine. Let sit until it comes to room temperature, or place in the refrigerator for an hour or more. 8. Freeze in an ice cream make according to the manufacturer’s instructions. I let my ice cream mellow in the refrigerator over night, and then I put it in the ice cream maker for 30 minutes. It never seemed to freeze; I just tossed the almonds in at the very end and then stuck it in the freezer. tragedy. I’m planning an Ice Cream Social for the late spring, possibly to coincide with the Kentucky Derby. So I wanted to begin testing out a few ice cream recipes, and I decided to use the menu for Lincoln’s second inaugural banquet as a reference. Because if it was good enough for Lincoln, it’s good enough for me! 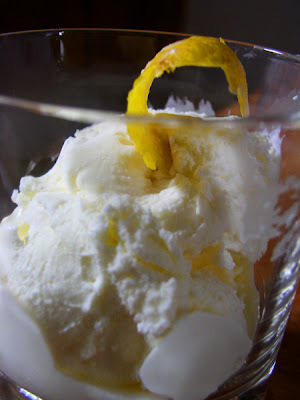 Lincoln’s guests were treated to Burnt Almond Ice Cream, which is built around a caramel base; Maraschino ice cream; and Lemon ice cream, which my friend Eva at the Merchant’s House Museum tells me was one of the most popular ice creams in the 19th century. I’ll be trying all of these, along with two modern creations (Cashew Cookie Dough and Chai Tea) and a frozen Mint Julep inspired by Jerry Thomas’ original julep recipe. But first, Lemon Ice Cream. The recipe is as simple as can be. I made only a small amount, but this recipe can be multiplied to suit your needs. Original recipe from The Complete Confectioner by Eleanor Parkinson, 1864.
and Directions For Cookery, In Its Various Branches by Miss Leslie, 1840. Add the sugar to the cream, a little at a time, and mix until combined. Grate the zest of one lemon into the cream mixture, being careful not to add any of the bitter, white pith. Juice the lemon and add to the cream, mix to combine. Let the mixture sit in the refrigerator for an hour or more to steep. I let mine sit overnight. Pour to mixture through a fine sieve or cheesecloth to remove the lemon zest. 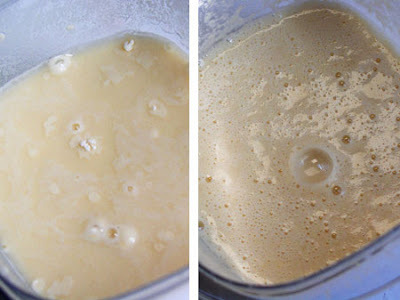 Pour into an ice cream maker, and let it freeze for about 15 minutes. Be careful not to over mix, or you’ll get frozen lemon butter. I like ice cream straight from the ice cream maker; the texture is similar to soft serve. But it is generally suggested that it should harden in the freezer for at least an hour before serving. Left: The mixture of cream, sugar and lemon steeps. Right: Coming out of the ice cream maker. I left it in a little too long and it got a little buttery, but it was still good. Rating: A+ This was easy to make and Delicious. 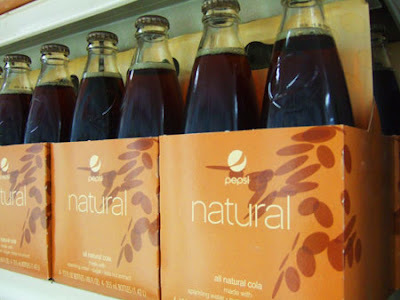 Refreshing and smooth, this would be really enjoyable on a summer day. But it’s very, very rich–it is pure cream, so a little goes a long way.